(4947.B, Oklahoma Historical Society Photograph Collection, OHS). Born in Alstead, New Hampshire, on November 22, 1786, Cyrus Kingsbury is remembered as "the Father of the Missions" in Indian Territory. Reared by an aunt and uncle in Worcester, Massachusetts, he earned a bachelor's degree from Brown University in 1812 and studied at Andover Theological Seminary. Congregational ministers in Ipswich, Massachusetts, ordained him in 1815. His mission field was the Indians. He first served Cherokee in the Southeast, founding Brainerd Mission near Chickamauga, Tennessee, in 1817. In 1818 his spiritual parentage shifted to the Choctaw of Mississippi. As tribal leaders embraced white culture, he preached and ran churches and schools first for the American Board of Commissioners for Foreign Missions and then for the Presbyterian Board of Foreign Missions and Southern Presbyterian Church. Kingsbury founded Elliot Mission for the Choctaws in 1818 and married Sarah B. Varnum that Christmas Eve. 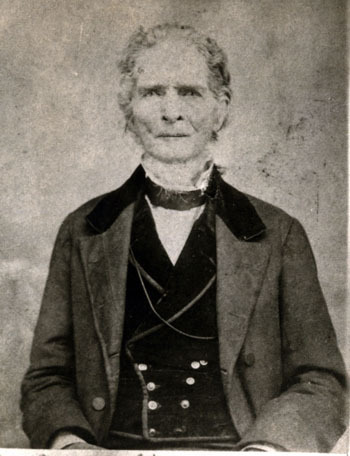 He founded Mayhew Mission in 1820 and led expansion of the mission system in Mississippi. Sarah died in 1822, leaving two small sons, Cyrus, Jr., and John Parker; the latter's interests would include editing the Choctaw Intelligencer at Doaksville, in the Choctaw Nation, Indian Territory, in 1850–52. The senior Kingsbury married Electa May in 1824. Accompanying the Choctaw on their removal west, he supervised the founding of Spencer Academy and Armstrong Academy in 1844 and other schools and churches in Indian Territory. Kingsbury served during momentous events in nineteenth-century Choctaw history. He witnessed land-hungry Mississippians push for the tribe's removal at the 1820 Treaty of Doak's Stand. He persevered through the abolition movement, personally opposing slavery but seeing his mission to preach to all, slave and free, as the higher calling. His stance caught him between his northern religious patrons and slaveholding Choctaws. During the Civil War he suspended his work when virtually every other nonmilitary enterprise stopped in Indian Territory. After the war he resumed his activities. After six decades of service Kingsbury died on June 27, 1870, at age eighty-three, as the lone missionary in the Choctaw Nation. Arthur H. DeRosier, Jr., "Cyrus Kingsbury—Missionary to the Choctaws," The Journal of Presbyterian History 50 (Winter 1972). Robert Elliott Flickinger, The Choctaw Freedmen and the Story of Oak Hill Industrial Academy, Valliant, McCurtain County Oklahoma (1914; reprint, Bowie, Md. : Heritage Books, 2002). Clara Sue Kidwell, "The Language of Christian Conversion among the Choctaws," The Journal of Presbyterian History 77 (Fall 1999). W. B. Morrison, "Diary of Rev. Cyrus Kingsbury," The Chronicles of Oklahoma 3 (June 1925). Arminta Scott Spalding, "Cyrus Kingsbury: Missionary to the Choctaws" (Ph.D. diss, University of Oklahoma, 1974). Richard Mize, "Kingsbury, Cyrus," The Encyclopedia of Oklahoma History and Culture, https://www.okhistory.org/publications/enc/entry.php?entry=KI014.